BÀ RỊA-VŨNG TÀU — The People’s Committee of southern Bà Rịa-Vũng Tàu Province has approved in principle a project to dredge Bến Đình drainage channel, a key channel in the city of Vũng Tàu which is seriously polluted by wastewater and domestic waste. The project was offered in exchange of an agreement that – after the dredging is completed – an eco-urban area will be built on 1,000 hectares on Bến Đình Island, it said. Speaking at a conference on Wednesday, Vice Chairman of the committee Lê Quốc Tuấn said the committee agreed with the proposal by the provincial Transport Project Management Board. The project would be conducted on an area of more than 80 hectares with investment capital of nearly VNĐ1.5 trillion (US$64.5 million). It will be implemented within five years. Under the project, as much as 3.4 kilometres of Bến Đình Channel and 3.8 kilometres of surrounding small channels will be dredged. A 5.6-kilometre dyke system will be built alongside the channels. The construction of roads and additional infrastructure such as water drainages, lighting systems, sheltering areas for vessels and trees will be carried out along a 3.1-kilometre route. The channel will have two entrance lanes with a capacity of 250 fishing vessels. After the upgrades are finished, the provincial Transport Project Management Board – the investor of the project – will be handed 1,000 hectares from the land fund on Bến Đình Island to develop an eco-urban area. A bridge will be built across the channel to connect Bến Đình Island and the mainland. Bến Đình Channel has a total length of 3.4 kilometres, stretching from Ward 5 to Ward 9 in the city of Vũng Tàu. It is a key location for fishing vessels, fishing ports and logistics facilities in Bà Rịa-Vũng Tàu Province. The channel has been collecting domestic waste and wastewater for years. 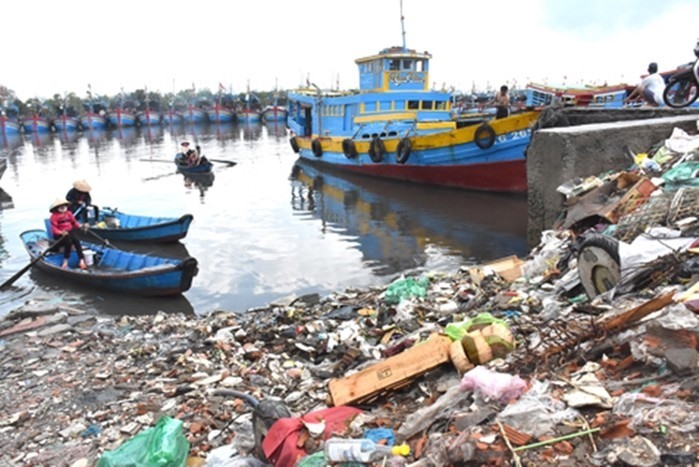 More than three tonnes of domestic waste and wastewater from more than 600 households are estimated to be directly discharged into the channel. In addition, waste from 1,000 fishing vessels and seafood processing stores along the channel have contributed to the pollution. Soil sedimentation has made the situation worse, blocking vessels from entering ports and sheltering areas, affecting the safety of waterways. Last October, the provincial Transport Project Management Board proposed two plans to dredge and upgrade the channel under the PPP model to the provincial People’s Committee. The first proposal would cost more than VNĐ1.9 trillion ($81.7 million). The second would cost nearly VNĐ1.5 trillion ($64.5 million) and include a clause that after completing the work, the investor would be handed land to build an eco-urban area with the capacity of 9,000 people. The management board has recommended the second plan. It would gain land worth nearly VNĐ1.4 trillion ($60.2 million), and the State would pay the remainder of nearly VNĐ100 billion ($4.3 million).